This adds a super super ugly/rough proof of concept of making suggestions when people search for functionality that Jetpack already provides. We've seen that people with Jetpack installed and activated often search for Jetpack features (even by name) in the Plugins > Add New screen in wp-admin. This new module attempts to spot those searches, and provide an artificial search result that calls out that what they're looking for is in Jetpack, which they already have, and which is already active. This code is definitely not ready for prime time; it should hook into our existing search terms for settings search, should use better descriptions etc, needs to use real plugin data vs the hardcoded bits I used, and needs to make it really clear that this is an artificial search result, not something coming from the plugin directory directly. See that the first result should be a Jetpack-powered card. 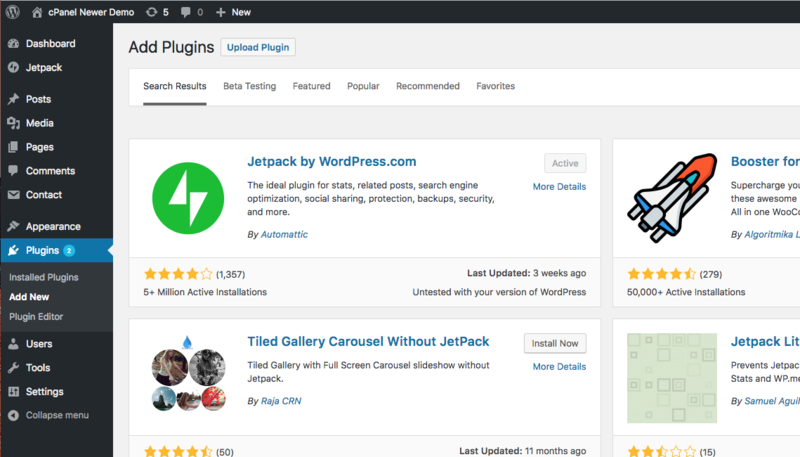 When people search plugins for features that Jetpack provides, give them hints. This PR looks like it might contain user tracking functions. We need to make sure that it is GDPR Compliant. * Put some more appropriate links on our custom result cards. We should make sure to add Tracks to these links, so that we understand how people are using it/which links are most useful, and probably also something that indicates whenever one of these cards/results are shown. Jetpack is activated, but not connected (yet) to WordPress.com -- probably display a "Connect" link. Local dev mode -- no connection. Module is active, but has no configurable options. I was just playing around with this and noticed that it doesn't kick in/load properly until Jetpack is connected. I think ideally this would be active as long as Jetpack is installed and activated, even before it's connected (to let people know that they've got stuff available, but it's not working yet because they're not connected). Just pushed up some things I've had staged for a while along with some other changes. This now works well both with the ajax-y loading of plugin search, as well as deep linking with the query string search (which would be what happens when you reload a search page). It's also dynamically pulling Jetpack's plugin info in to populate the card, and has a number of other enhancements. Modules without configuration pages will display a configuration link after clicking 'activate' but on subsequent reloads will not. This is because of the current way we determine whether a module is configurable, which depends on filters in the module itself, that we can't test until it's active. Probably should do an audit of the keywords we're responding to searches for -- and handle translations for them. Add more tracks for seeing how this is useful to users. What are our relevant events that we would want to compare? I'd suggest tracking occurrence of a module card being displayed, occurrence of a module being activated / configured off a card, and perhaps occurrence of another plugin being installed with / without one of our modules being displayed, to provide some context. Perhaps split it out per module. This may also be too much data. Unsure. Add a filter per-module that will let us entirely customize the card displayed for a given module, rather than just use the existing format. For example, for the Jetpack Contact Form, we may want to add a "Try It Out" link -- that will take the user to a new post page, with a contact form already inserted, that they can then begin tweaking. Add a kill switch if users want to disable these? None of these I think are strictly necessary, and I think most (all?) could probably be punted to a v1.1 done after we get initial feedback from a first quiet launch / user testing. I believe we're also waiting for a Master Thread post from @jessefriedman but I've not circled back with him directly about that since we spoke just before the holidays. Just a note, we'll need to confirm that the styles we write for this have commensurate versions in Calypso-ify. Plugin Search: Add proof of concept. Activate the module (via debug module list), then Plugins > Add New > search for "contact form"
Don't include description, it'll never match. Switch to dynamically pulling in Jetpack's plugin details. Hello beaulebens! 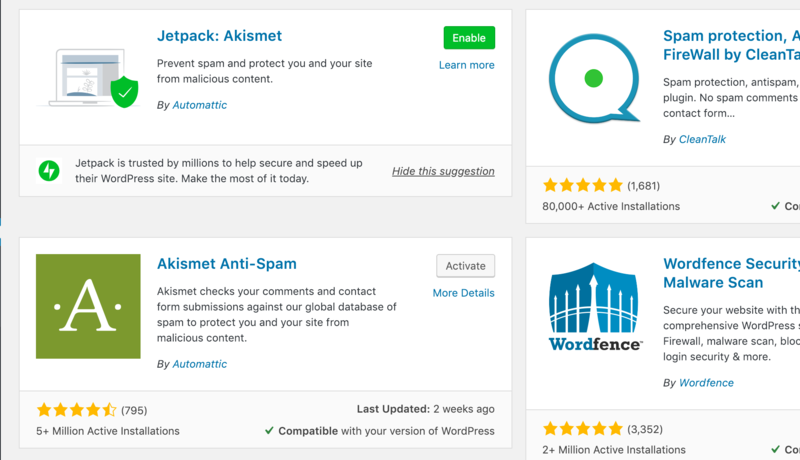 These changes need to be synced to WordPress.com - If you 're an a11n, please commandeer, review, and approve D24833-code before merging this PR. Thank you! search for Contact Form or another module that does not have visual settings. When it's active, a "Get started" button should be displayed and the "Learn more" link should be hidden. Where should that get started button lead? I tried searching for "Publicize" when the module was inactive. I then activated the module via the hint card, and the "Get Started" button was linking to https://jetpack.com/redirect/?source=plugin-hint-learn-publicize. I assume, like for JITM, that is how we want to track the clicks on those links? Do we need to test with a specific Phab diff applied, where those redirects are set up and that plugin-hint-learn-publicize source redirects to the Sharing page in Calypso? Do we want to track dismissals as well, to see if some suggestions are not deemed relevant by a lot of users? When I click on the card title or the card image, I would expect to learn more about the feature. Instead, the modal that pops up is for the Jetpack plugin itself. Is that okay? Could / should we use the same link we use for the "Learn more" text instead? This will be super useful! Nice work! I left a few questions in comments above, and inline. // Never suggest this module. We probably do not need this anymore. Given that it's a fairly generic image, I wonder if we should add it to the images directory instead; maybe we can re-use it for other things in the future? I don't think that worked in my tests. 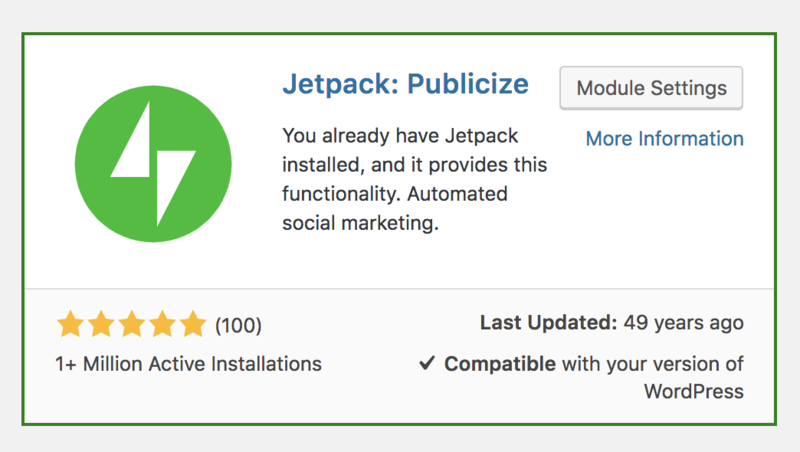 The "configure" link for Publicize was still the link to the Jetpack Settings screen. Do we need this here, given that we don't seem to initiate anything when the plugin is not connected to WordPress.com? beaulebens, Your synced wpcom patch D24833-code has been updated. This code is _definitely_ not ready for prime time; it should hook into our existing search terms for settings search, should use better descriptions etc, needs to use real plugin data vs the hardcoded bits I used, and needs to make it really clear that this is an artificial search result, not something coming from the plugin directory directly. 4. See that the first result should be a Jetpack-powered card. 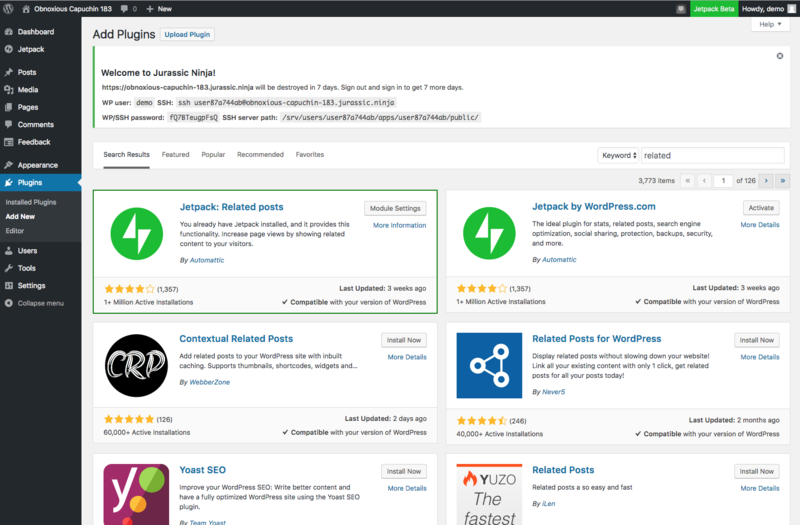 - When people search plugins for features that Jetpack provides, give them hints. Translators were asking what type of card this is. Please add a context or a translator comment to clarify.